IT’S ALMOST HERE! Not only is Saturday Halloween, but it’s also my birthday! With that in mind I wanted to get in one more festive post before the double holiday, and that’s the DAVIDsTEA The Pumpkin Collection*. 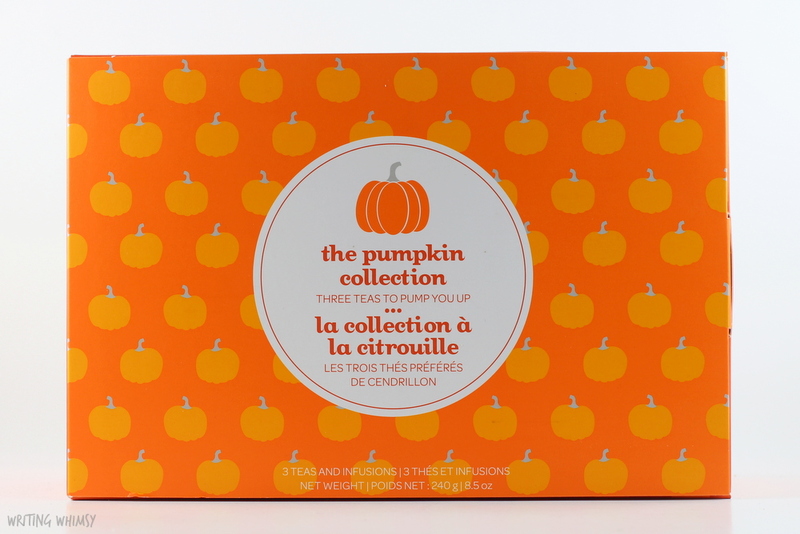 This is a great set of three different pumpkin teas–including 2 brand new ones–in an adorable cardboard box. The teas come in three orange tins that form a lovely ombre together, and each one contains 80 grams of tea. 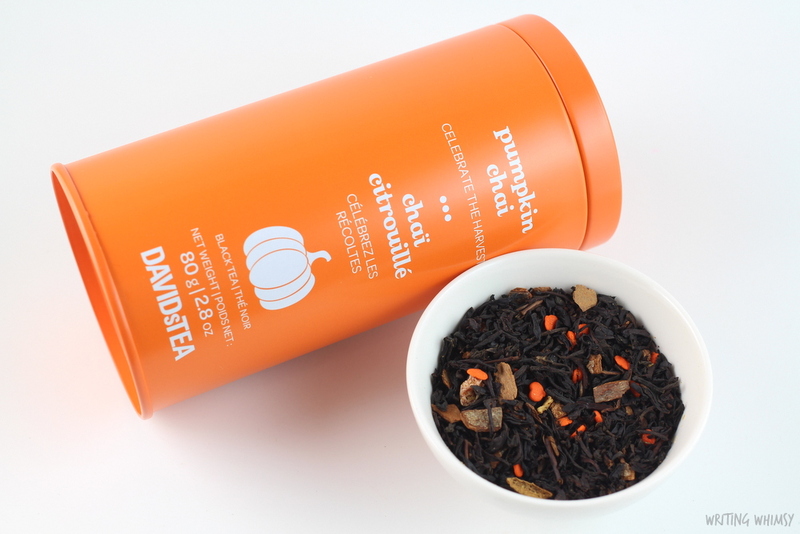 I love the classic Pumpkin Chai,but I was pretty excited to see DAVIDsTEA expand in the world of pumpkin teas that are just so seasonal for fall. 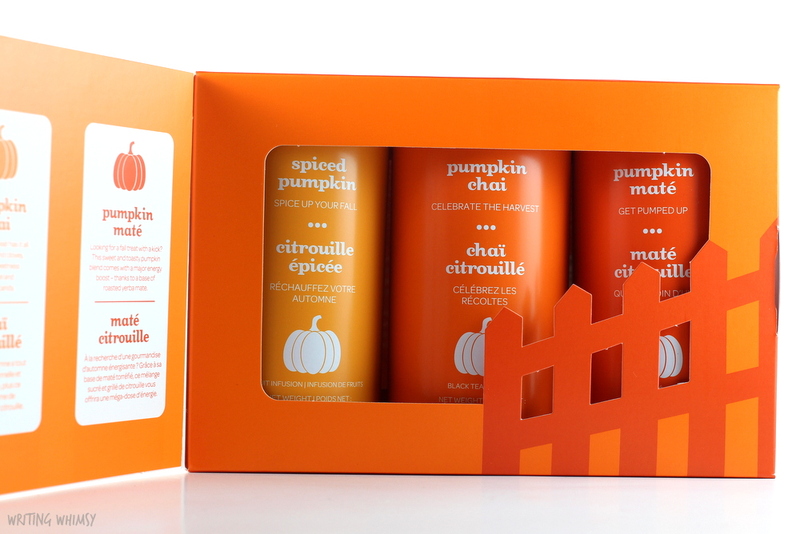 The DAVIDsTEA The Pumpkin Collection includes Spiced Pumpkin (herbal), Pumpkin Chai (black) and Pumpkin Mate (mate). The teas are also available individually, so matter what kind of tea you like to drink there’s an option for you! Unless you like green tea…in which case, yuck. 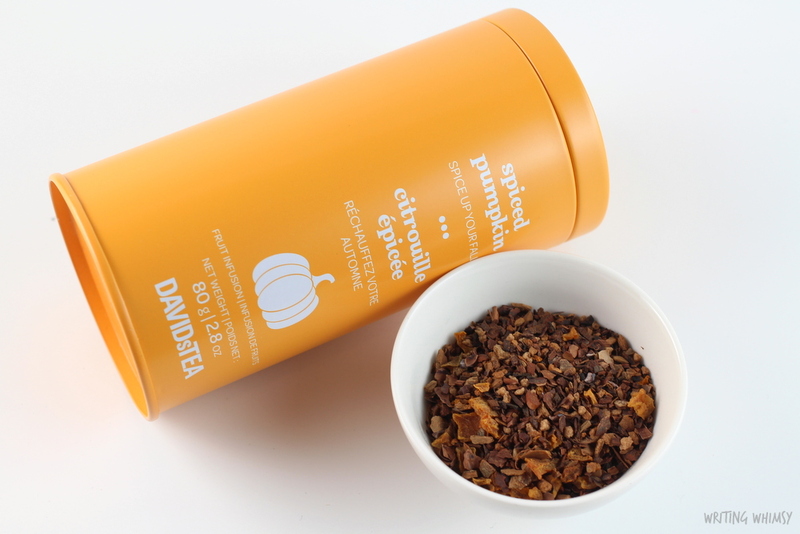 DAVIDsTEA Spiced Pumpkin is a sweet herbal tea that reminds me a bit of Snickerdoodle from last fall, without being overly sweet–so this is definitely one I prefer. It has a sweet (there’s that word again, sorry! ), warm, smooth taste and to be honest, even though pumpkin pieces are the first ingredients, I wouldn’t say it was heavy on the pumpkin. It has much more of a cinnamon, honeybush, maple flavour to me, almost like last year’s Maple Sugar (which I also love) but without the black tea element and with an added creaminess. DAVIDsTEA Pumpkin Chai is a tea I’ve actually reviewed twice before, in 2013 (here) and 2014 (here) but DT keeps bringing it back and I’m definitely not going to complain! I really love this tea, it’s a black tea filled with pumpkin spices like cinnamon and cloves, there’s a hint of sweetness form caramel as well as adorable pumpkin candies. As I said back in 2013, this is really a tea that reminds me of pumpkins and fall, more than it actually tastes of pumpkin, because the spices are more like pumpkin seasoning. However it does have a hint of earthiness from the addition of carrot. Pumpkin Chai is a very warm, cozy tea perfect for the colder weather. It would also make a pretty delicious late! 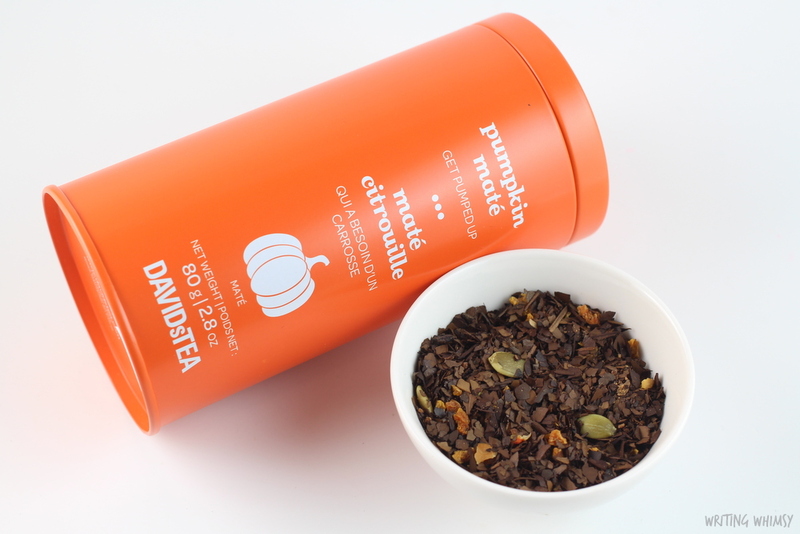 DAVIDsTEA Pumpkin Mate is the second new addition to the DT line up in the Pumpkin Collection. I really love a mate tea in the morning to give me a boost and I just finished my tin of Queen of Tarts so as much as I love it, I was definitely curious about this new option. Pumpkin Mate is definitely the most pumpkin-y of the three, since it actually has pumpkin seeds in it! The scent is very earthy and spicy, and there’s definitely a warm earthy pumpkin taste as well. Pumpkin Mate isn’t my favourite mate from the brand since I tend to prefer the fruitier ones, but it is a nice seasonal take for the tea. It’s rare to see a mate in a seasonal tea collection from DAVIDsTEA so I hope that this isn’t the last one! 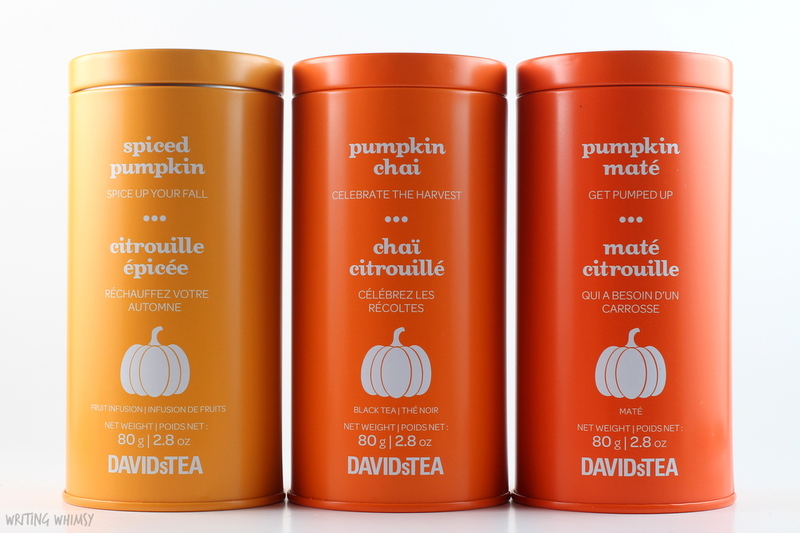 Look how adorable the DAVIDsTEA The Pumpkin Collection is all lined up beside each other? No matter how you want to get your pumpkin fix–sweet, spicy, or earthy–there’s a tea for you.